I, for one, want to see slurry walls sunk under the Grand Junction to route a Green Line connector between BON, West Station, and Kenmore to provide looping service through East Cambridge and the Kendall/Mass Ave parts of Cambridge or something similar, FWIW. BandA wrote: Everybody is so concerned about the North Shore commuters getting to Kendall, but they are openly hostile to Framingham/Worcester commuters getting to Kendall. Interesting. Maybe I don't get what this is in reference to, but, Framingham/Worcester already has a direct Red Line connection at South Station? Maybe a bus at Boston Landing would help, too, as its a pretty straight shot into Kendall. Or are you alluding to something with the Grand Junction, which I think has been discussed pretty thoroughly and isn't anywhere near an apples to apples comparison of a ~2k foot cut and cover subway from Bowdoin over to MGH, which, again, helps the entire system out, not just people on the North Shore. Many years ago there there was a subway track entrance on Bowdoin Street that was visible from the (now) Red Line as the train approached the Charles station from Park Street. I understood it was originally used to move streetcars from the East Boston (now Blue Line) tunnel to the Bennett Street shops near Harvard Square. A single track ran from that tunnel exit and beside the "Red Line" over the Longfellow Bridge to a sliding fence gate on the Cambridge side where it joined the subway track into Kendall. From there the streetcars ran through the subway to Harvard and the Bennett Street yard. As of 1951 I never saw this track in operation - it was sealed and paved over many years ago. 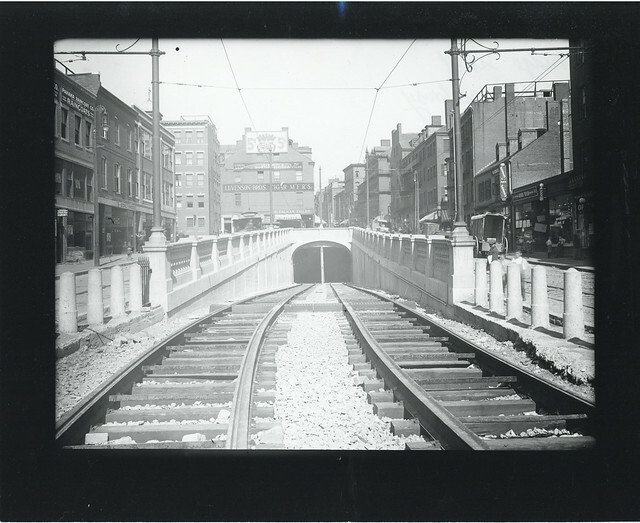 Does this tunnel still exist below Bowdoin Street? If so, I wonder if this vacant tunnel could be part of the plans for the Red-Blue Connector. The tunnel does exist as tail tracks for Bowdoin Station, though they're rarely used. 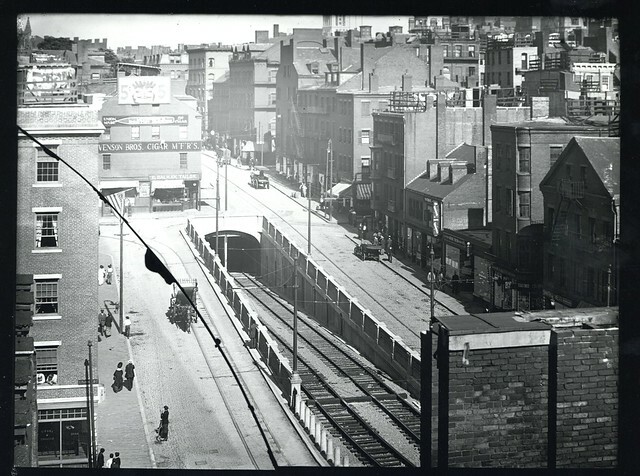 When the East Boston Tunnel was still a trolley line it was part of a double-track route stretching from Cambridge all the way to East Boston. After the tunnel was converted to rapid transit, one of the surface tracks over the Longfellow Bridge was retained for transferring subway cars to Elliot Shops (next door to Bennett St Shops) for maintenance. The connection was removed when Orient Heights opened in 1952. Not sure what everyone here thinks about the Transit Matters folks, but they frequently contribute to Commonwealth Magazine with various ideas on how to improve the MBTA system. One of them, Ari Ofsevit, recently published a proposal for the Red-Blue Line Connector. He suggests that the Blue Line not stop at Charles, but continue north of the Longfellow under the Charles River to the Volpe Site in Kendall: https://commonwealthmagazine.org/opinion/think-bigger-on-red-blue-connection/. He gives his reasons in the article, and it would require coordination with MIT as the owners of the Volpe redevelopment site to make it work. I remember past mentions in this thread (or somewhere within the forum) that any BL connection to Charles would require a decision to locate the station around the Longfellow supports either toward the north or the south. The point of which would then allow further expansion toward Cambridge/Somerville if pointed north, or Back Bay/West if pointed south, in addition to the necessary safety, storage, etc. requirements with the closeness of the bridge and all that. If it is technically feasible, however, it would offer an additional heavy rail connection to an area that is critically transit-starved and would open up tremendous expansion possibilities with the short distance from Volpe to the Grand Junction ROW. It would also relieve what would be a tremendous chokepoint at Charles if the BL stopped there to get folks over the bridge to Kendall/points north on the RL. I think this is the sort of forward thinking proposal that is clearly lacking at the MBTA and with our political leaders in MA toward the MBTA system. Of course all the stuff about paying for these projects, etc., etc. is yet to be determined, but the FMCB's work, if it survives past 2020, must find it eventually necessary to pivot from cost-control/fixing what's there now to some sort of expansionary mindset with additional funding sources to address the critically deficient aspects of the system as a whole. Would there really be a chokepoint at Charles if the Blue Line were extended to there only? Or would the passenger crowd on the Charles platforms be the same people who nowadays transferred from the Blue Line in Downtown Boston and came out on the Red Line from Park St.? Or would the opening of the Bowdoin to Charles extension bring about a sudden large increase in overall ridership so as to overcrowd the Red Line trains from Charles into Cambridge? The new loop at Volpe is laughably close to the Red Line Kendall stop. So let's keep dreaming and make this part of a grander extension. Pop out of the ground at Volpe and hook up to the GJ - then head south and west... Extend the Blue Line onto the Worcester Line ROW and out to Alston/Brighton/Newton. Put up a huge garage with direct offramp and terminal station at the Riverside area. Boom, you've just provided a cheap and convenient option for Metrowest commuters to come into Kendall instead of the pike and the miserable Cambridge/Allston exit. They can run Panto's on the Blue Line, right, so that might help assuage some of the grade crossing issues in Cambridge. I don't think they would ever go for rapid transit and grade crossings even with pantos. Sure Chicago has it e.g. the Brown/Ravenswood line, but that is grandfathered and nobody would ever build something like that today. You could elevate it at the Broadway crossing, but the air rights building at Main St would stop it. Maybe weave down to Vassar St and back onto or above the GJ. So you would remove the Grand Junction from Commuter Rail / freight access? Also there is only extra room to shoehorn tracks to about Fanueil. That´s just crazy when the T hasn´t agreed to even slap a second side platform on the Newton Stations. And there isn´t going to be enough room at Riverside for a Superstation after they sell (give away) development rights, if that hasn´t already happened. Plus the Mass Pike & 128/95 can´t handle more traffic at that interchange. I still think that extending the Blue Line from the Bowdoin tail tracks the 1500 odd feet to Charles should be done separately and sooner as a Phase 1, and we should worry about further extensions later. There was a story on Channel 10 today about how a petition is going around with massive public support to get the red-blue connector built. The MBTA recently released an updated future plan which lacked any mention of the red-blue connector which came as a surprise to many who thought it was a no brainer. Because of this they created the petition and are hoping to change the MBTA's mind and make this a priority. The plan is for funding. These are things the T plans to spend money on and they show this to the feds to get their money to spend. They evidently don't think the connector is worthy of looking for federal funds. I agree for two reasons. 1.) I don't think there is as much to gain from it and it threatened to eliminate Bowdoin which has had enough of a push to get it reactivated full time. It seems pretty clear that in a tug of war between Connector/Bowdoin, Bowdoin wins (it's also probably what pushed Bowdoin's return to F/T status because leaving the station open is cheaper than the capital expense particularly if the feds aren't going to kick in). 2.) All of that would be moot if the organization(s) that want this accomplished so much (MGH) came to the T with cash instead of signatures. Assembly, Boston Landing, and Wachusett never showed up on a CIP or future plan, but when someone went to the T and said if you build this we'll pay for it, it got built. Not including it in the plans isn't an aversion from doing the project, it's an aversion from paying for it.